More and more organizations are viewing customer experience as a strategic priority. As firms strive to establish a competitive advantage through customer experience management, it becomes clear that they must develop a deep understanding of experience management to evolve a solid strategy and approach. 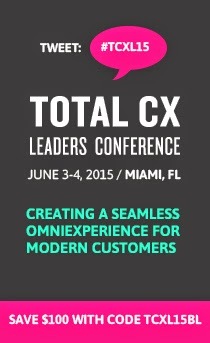 The 2012 Total Customer Experience Leaders Summit is an event that not only redefines customer centricity, but explains what this means for you, your brand and your business. It will unite diverse industry leaders to share genuine insights and best practices for "Designing an Integrated Experience with a Measurable Impact." Download the brochure to see the full program here. As a reader of our blog we’d like to offer you a 15% off the standard registration rates, use code TCEL12BLOG to save. Register today. Visit the webpage to register today.